Wednesday September 25th 1901 We made all arrangments to get dinner for the men they came but it rained some so they did not stay. In the afternoon I finished papering closets and painting floors up stairs. Thurday September 26th 1901 I went down home early and Mother and I took a ride out to Tishie Hedges. I got peaches on the way home. I stopped for dinner at Mothers and came directly home and made peach butter in the afternoon Will was away most of the day to the Dennis sale. 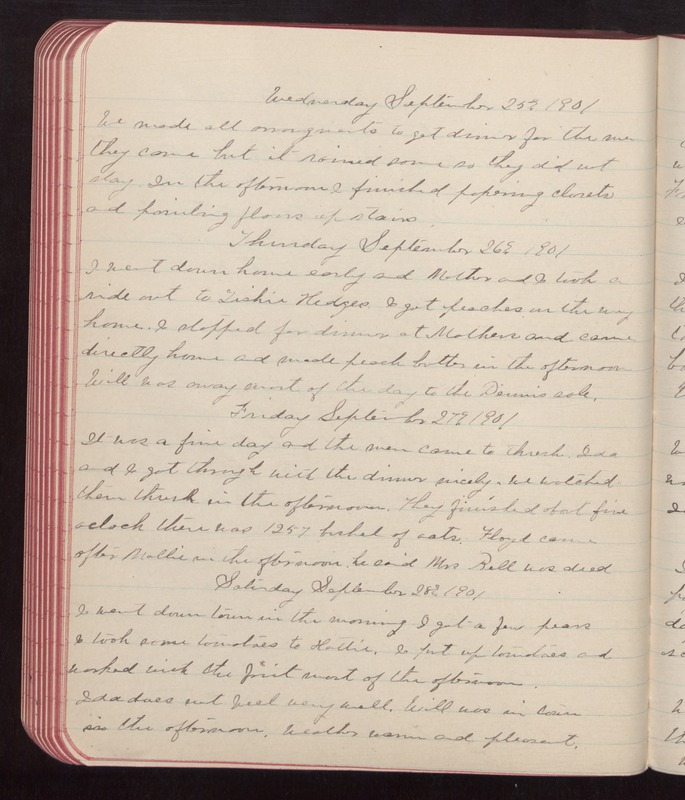 Friday September 27th 1901 It was a fine day and the men came to thresh. Ida and I got through with the dinner nicely. We watched them thresh in the afternoon. They finished about five oclock there was 1257 bushel of oats. Floyd came after Mollie in the afternoon. he said Mrs Rell was dead Saturday September 28th 1901 I went down town in the morning. I got a few pears I took some tomatoes to Hattie. I put up tomatoes and worked with the fruit most of the afternoon. Ida does not feel very well. Will was in town in the afternoon. Weather warm and pleasant.